About to slow sip some Rebel Yell Small Batch Reserve while fondling my grab bag BG EPD in tanker grey and bruiser grips. This is a sweet blade guys. I wish it was INFI, but I'd be lying if I tell you that I'm not intrigued by this blade the more and more I fondle it. I was drinking a California red, but now I'm thinking it might be time to open the Rebel Yell Small Batch Reserve. It's one brand that consistently punches above its weight. Knob creek is always a favorite for me, however im on an eagle rare kick as of late. Just playing with some Busses and Bourbon. This 110 proof Russels Reserve Single Barrel has me feeling good. Can’t keep my hands off the MO BURP and am always messing around with my Battle Shark stripper. Hope this finds everyone doing well! Leonardo63 and TheirProtector618 like this. View attachment 796678 View attachment 796679 Cheers all! Beautiful strip job, makes me want to do the same to mine. Thanks brother. Of course the CBT is a challenge but well worth it. 400 Conejos Mezcal. Not my favorite Mezcal, but pretty good. I like it more the more I drink. After about half a bottle, that's damn tasty stuff. Looks like some sort of red wine. 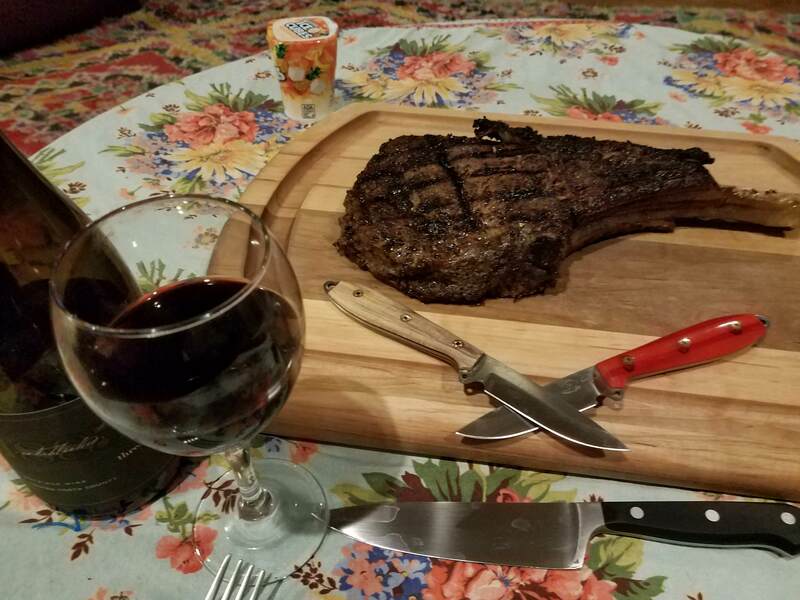 Lately I've been getting the Cowboy/Tomahawk Steaks at Sam's. Enough for two, with half left over for sandwiches (or whatever). Cooked right, it's as good as any steak I've ever had.